Today and yesterday have been kind of weird days. I said in the last post I need to get back to a couple unfinished acrylic paintings, well I haven't, at least not yet. Instead I've been feeling very conflicted about working in pastel vs working in acrylic. I even went so far as to start an experiment last night. 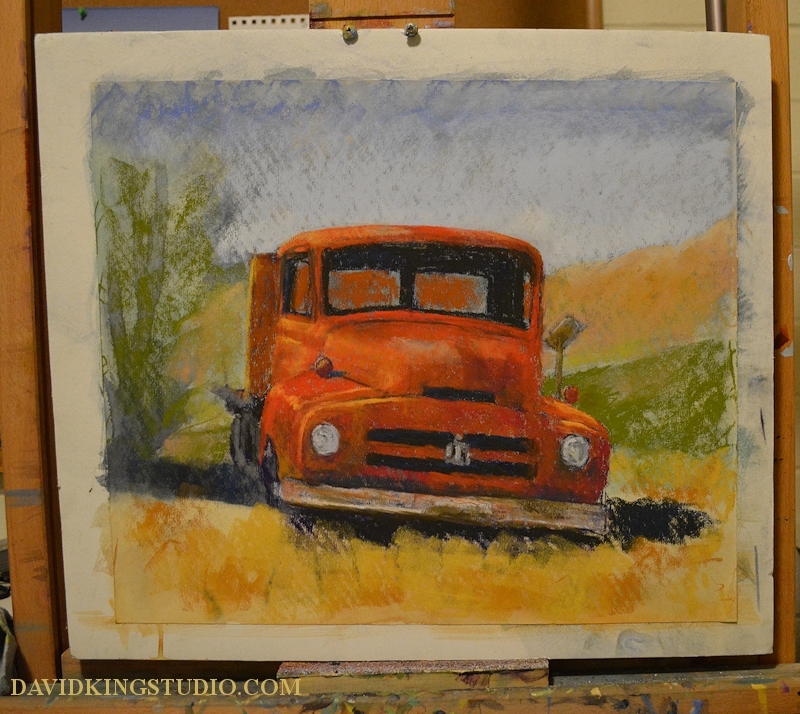 I started two paintings of the same subject in the same size, one in acrylic and one in pastel. 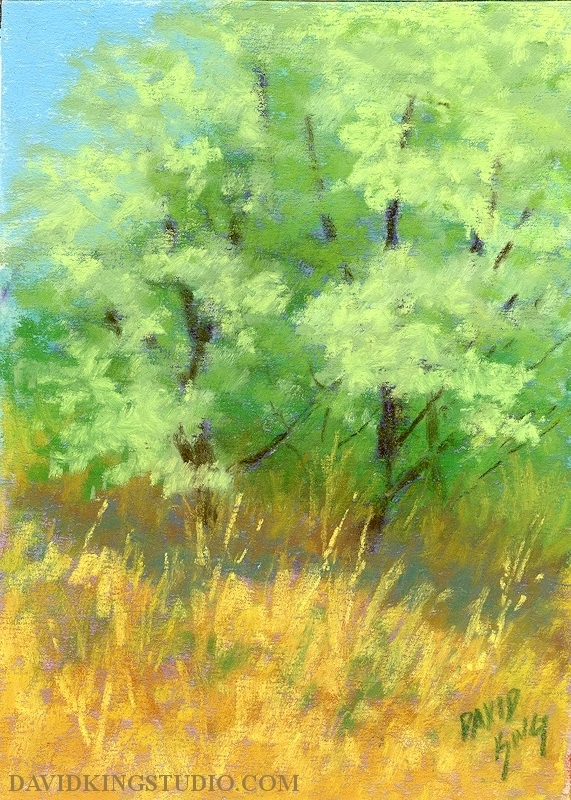 I'd spend some time working in pastel, take a break then spend some time working in acrylic. I did this a couple times last night and then again today. Acrylic was winning, for some reason the pastel painting was fighting me. It wasn't until today in the afternoon when is occurred to me it might be because I switched surfaces. I painted "Red International" on Uart 400 which is a sanded paper I had mounted to acid free foam board. 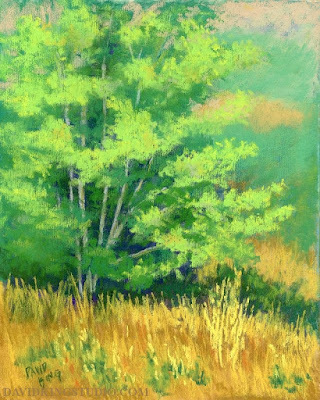 For this experimental painting I switched to Ampersand Pastelbord. I was so sure that I would like Pastelbord it didn't even occur to me that I might not, turns out I don't and am very surprised. For some reason the pastel just was not coming off as easily with the Pastelbord, it felt scratchy rather than smooth. The tooth was easier to fill in to get a smooth look, but the application wasn't smooth, it's hard to describe, I just didn't enjoy using it. I'm sure it's the perfect surface for some people but not for me. So now I'll have to restart the pastel side of my experiment using Uart paper this time. In the mean time I decided I need to take the pastels outside so I went to Olympus Hills Park in the city of Holladay, Utah. "Silver Trees by the Path"
If you've been watching the blog for a while you can clearly see that the pastel medium results in far more colorful paintings for me. I'm not sure if that's a good thing but it is interesting. As for the experiment I'm sure there will be no clearly defined winner, there are good and not-so-good things about each medium. I'm guessing I'll be going back and forth with them for a while, this is kind of hard to swallow for a guy that prefers simplicity. I was real good at sticking with acrylics for nearly a year, but man how I've fallen off the wagon! I'm pretty happy with this one, but I have a couple acrylic paintings I need to get back to so I'll try to resist doing more pastel until I catch up. For more information about this painting check the previous WIP blog post about it. What's that? Pastel you say? Yep, that's right, I dug the pastels (dry pastels that is) out and started a new painting. I'll get back to the "Passed it's Hay Day" painting soon enough but for now I had the urge to get dusty. I've never tried to do a truck painting with pastels, in fact it's been since last summer that I last painted with pastels. The background hills were more or less in the old painting as was the tree/bush on the right, so a little bit of the work was already done for me. Soft pastels are known for their vibrant color so I tried an experiment, I worked from a photo that I had converted to greyscale which meant the colors were totally up to me! Once I got started I totally forgot that the truck in the photo was actually green with some red parts and instead painted the whole truck red with some orange accents. Ya, I know the light version of red is pink, but pink always looks dull and chalky to me so I used a yellow-orange instead. I had so much fun with this tonight this could signal a return to pastels for me, we'll see. First I need to finish this painting. It does need some adjustments to the drawing but I think I can wrap it up in one more session. Right now the painting is 15" X 17 1/2", I think in the end I'll probably crop it to a standard 12" X 16". 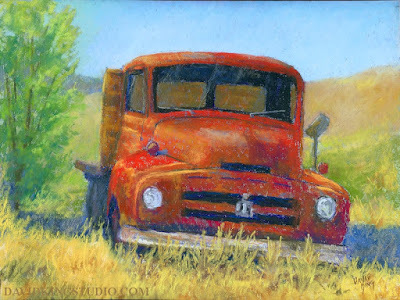 FYI, the truck is a 1953 or 54 International, I found it in a wrecking yard in Nephi, Utah.